At first I thought I was way too busy to do this challenge but then I kind of got excited by it & in the end Matt & I had so much fun making our little houses that I'm really glad we did it. I decided to do a village of small houses which for some reason seemed more managable to me than one big house. Then I spread the project out over 3 days which also made it not seem so big. Day 1, I made the dough & let it refrigerate overnight. 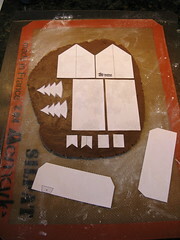 Day 2, using templates for 2" x 3" house that I found here & here. I just cut the templates out of paper & laid them on the dough then cut around them with a sharp knife. Here are some things I learned. 1. Flour your template. 2. Press the knife down to cut the dough don't drag it or your dough will pull. 3. Remove the template right away or the dough will stick to it & ruin your piece. I also cut out a few small trees to add to my village. 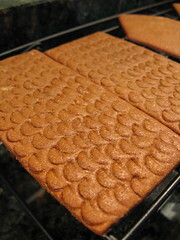 I used different cake decorating tips to make textures on the roof pieces before baking. I didn't have much trouble with the dough shrinking while cooking though it did puff up in some places. 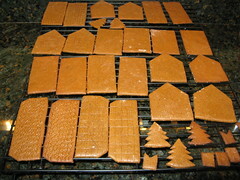 I let the cooked gingerbread pieces sit overnight on the counter to get really dry. Day 3, was all about decorating & assembly. 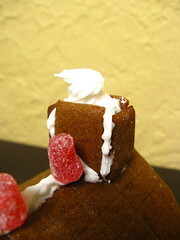 I good stiff royal icing is really key to getting the houses to build easily. With thinned it out with water as needed for different types of decorating. I used meringue powder in my icing which worked really well. 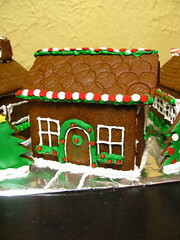 We did some of the piping work for windows & doors before putting the houses together. We figured it would be easier to do with the pieces lying flat. I made a base for the village from a piece of cardboard covered in tin foil. 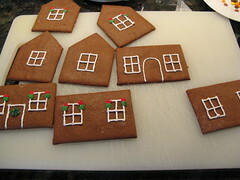 Then we piped a line of icing for each side of the houses to help secure them. 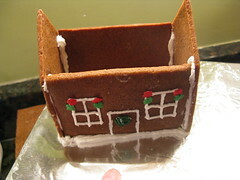 After all four sides were up we let the icing dry before putting on the roofs. Then came the fun part of adding all the other decorations. We thinned the icing out with a little water to coat the trees & make the dripping snow on the roof. Thick icing made great smoke from the chimney. The next week I got invited to my cousin Lucas' first grade class to help make a gingerbread house as well. We went a little easier route by attaching graham crackers to milk cartons with frosting but the results were just as cute! This post is dedicated to my $7 Target hand beater that met an untimely death while making royal frosting. Love your little village! It's super pretty with the white, red and green. Looks like you had fun and the dough seemed to work quite well for you. Excellent job! This is so fun. Your village looks great. 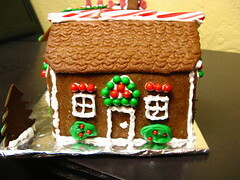 I just love gingerbread houses. My mom always makes a great one, but she usually starts with a kit and decorates on her own from there. This is impressive. Wow, great job on your gingerbread houses!! I love the texture you had on your rooftops! RIP hand mixer....job well done. It's a heck of a way to go. Your village is wonderful! The details are great, especially on the roof. 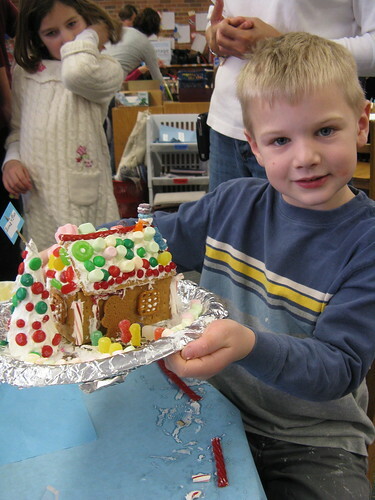 Wish one of my classes involved making gingerbread houses - lucky Lucas and classmates! Your village and your cute cousin are so sweet. Too bad about the Tarjay mixer but now you have a great excuse to go shopping! Just wait until the holiday hoopla is over though. Your houses look to have come out perfectly! Great little village! your houses look beautifull! Merry christmas! Those are so cute! We made gingerbread houses this year, but I ended up using graham crackers as I didn't think I'd be able to pull off homemade ones. Looks like you did perfectly! I can't believe that this was the dare for December! It's such a hard challenge, but you accomplished it with flying colors! They're so sweet! I love all of the houses =D. 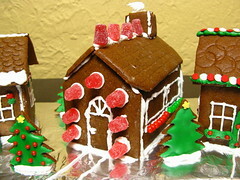 your houses look fantastic and delicious! congratulations on this daring baker! your village is just lovely! Those are darling. Good job! What sweet little houses. I think it would be too much for me to do though! I love your little village and the texture on your roofs is so neat. I'm from MN too - hope you survived the snowstorm! My condolences to your hand mixer :( But at least your houses were fabulous! Gorgeous little houses! 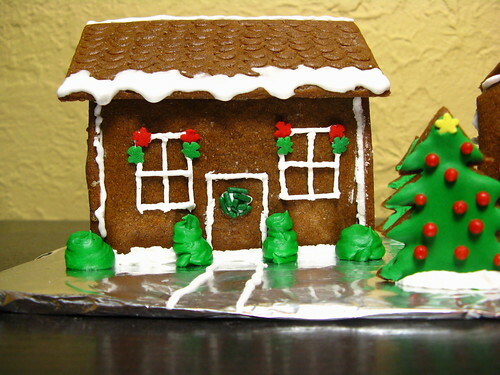 You did a wonderful job on your gingerbread houses. Aw what a precious village! I love your textured roofs. Impressive village of houses, by the way! 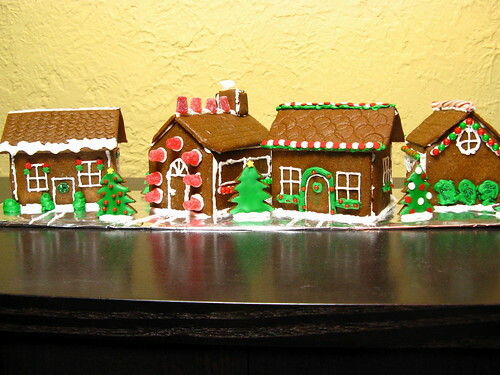 Awww... you made an entire gingerbread village! Way to go on this month's challenge, you rocked it out! Keep up the amazing bakes. A whole village. I love it. You were really ambitious. Your colored houses are just ouzing Christmas all over the place. Those roofs. The green details. The lovely red. Love it! LOVE IT! I adore all the piping details on the windows. Great job, you two! WOW, what an absolutely perfect and beautiful little village! I had enough trouble making one house, so kudos to you for making several! The -piping is phenomenal! Wishing you and yours a Happy New Year!